Sell My Car in Swindon. Quick and Safe Car Sale at We Want Any Car. Swindon has a reputation as being one of the roundabout capitals in the UK; with many magic roundabouts making it almost impossible to navigate your way around. Getting successfully around a magic roundabout might be difficult, but it is just as easy to get yourself into a spin when selling your car or van in Swindon as well. However, using WeWantAnyCar.com is the safest route to take to avoid any wrong turns when finding the right buyer for your beloved vehicle. Want to sell your car in Bridgemead, Swindon? We are one of the UK’s favourite car buying services because we are prepared to go the extra mile for our customers. This starts with us having over seventy locations in the UK, which means you are never too far away from our experts. Our professional team make it quick and easy for you to sell your car and receive quotes. A stress-free alternative to costly and time consuming private sales. We also ensure you will receive a guaranteed and secure payment directly to your bank account. Situated in Bridgemead’s Sainsbury’s car park, this one-stop-shop provides an immediate car buying service with expert friendly staff on hand to help every step of the way. Just off the A3102, near the M4, our Swindon pod is open every day, 9 am till late, always ready to give you a great deal on your car. No need to spend long hours on the phone talking to potential car buyers! Enter your vehicle’s and your personal details accurately into our online valuation tool. Receive an instant market no obligation valuation of your car or van based on trade guidelines; the valuation will appear on the screen straightaway and will also be emailed to you. Book an appointment with the Bridgemead branch team to discuss the valuation and process in more detail. If you are happy with the estimate then our team can arrange everything at your local branch for you. The valuation email will help you with what documentation you’ll need to finalise the sale on your visit. So, whether you want some extra cash for a new holiday, some new threads or a new car you’ve had your eye on; we want any car regardless of age or condition. 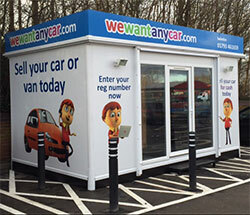 Don’t hesitate to get in touch with our friendly purchasing manager Jason Scearce on 01793 461 659, email swindon@wewantanycar.com or why not drop by for a consultation on your options. Excellent experience . Colin at Swindon was very polite and helpful and I got a fair price for my car . He was very thorough in his appraisal of my car and I was satisfied with the outcome . The whole experience was stress free and straight forward . Agreed final price including fee was roughly 4.5% below quoted online price as the vehicles next service was due and had 1x kerbed wheel. Final payment including fee was still 3% better than the other well known car buying service (before they apply their adjustments), would recommend if the online price is decent and your car is as described. I had beer trying to sale my car for 3 months with no success finally took it to we want any car and got 350 pounds more than the best private offer. I booked an appointment online with the Swindon Office. Within minutes I had a call back confirming the appointment. Colin talked me thorough the whole process and within an hour the car had been sold at a fair price. Colin was very helpful and the whole process was conducted in a relaxed yet professional manner. A breath of fresh air compared to my experience with WeBuyAnyCar.com. Glad I found WeWantAnyCar.com and cannot recommend them highly enough.